Choosing the right Real Estate Agent is often a matter of trust and chemistry. Robert has been with Coldwell Banker La Costa since 2003 and over the years has received numerous company and corporate Awards. 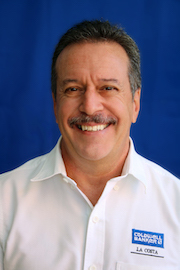 After over 25 years of living in Puerto Vallarta, Robert has dual nationality with multi-linguistic skills and his fluent in Spanish, English and French, which makes him undoubtedly one of our company's most experiences Realtor. You can imagine the experience and knowledge he acquired being involved first with tourism (Hotel Manager), followed by the realization of one of his dreams as a Dive master and Scuba Diving Instructor and finally graduating from Coldwell Banker University now pursuing his real passion “Helping people realizing their dream” by becoming part of our unique and lovely town - PUERTO VALLARTA. Robert's success lies on his commitment to providing an outstanding service followed by fantastic 'after sales' attention. Whether he is representing a Buyer or a Seller, his customers always benefit from his experience, knowledge and professionalism. Robert has proved to be a key advisor for our clientele. Full of energy, prompt, and a great sense of humor combined with an eye to detail are a few of the characteristics you can expect from him. When it comes to buying or selling, you can be sure he is one of the hardest negotiators in town. He truly believes that his customers’ best interests are his best interest. If I can ever be of any assistance to you with your clients, please don’t hesitate to have them e-mail me or call. I can tell you that I have been a licensed real estate broker for 31 years and have been training agents throughout the United States and Canada for the past 20 of those years. In that time I have worked with many agents in various parts of both countries. I had never purchased a property in Mexico until this year (2005). In the process of purchasing I contacted several agencies and agents. I gave them a lot of information and asked them to contact me with any questions they may have for me. I can tell you that many of the agents never even called me back. When I requested information to Robert Bertrand, he responded within an hour or two both with an e-mail and a phone call. He asked me several very important questions that I had not considered, but were specific to purchasing property in Mexico. After much communication, I traveled to Mexico where I met Robert for the first time in person. He took me and my family out to view properties that he had identified as potential properties that we would be interested in. He also offered to go over all the legal requirements that were involved in the purchase. We found a property, negotiated and are now very happy to say that we own a home in Puerto Vallarta. The entire process took only a month or so and I can say that without a question, that one reason we are so happy with our purchase is that Robert is such a professional. I would gladly refer Robert to anyone thinking of purchasing property in Mexico. Additionally, I would be happy to talk directly with anyone that may have specific questions concerning my purchase or their potential purchase. La hemos pasado muy bien durante nuestro encuentro para la comida éste fin de semana contigo en Puerto Vallarta. Dejame reiterarte mi agradecimiento por el proceso de compra de nuestro condominio en Nuevo Vallarta. Desde el momento cuando te contactamos siempre has sido una persona muy responsable, puntual y sobre todo confiable destacando que eres un conocedor en tu materia y temas relacionados. Desde que hicimos nuestro primer recorrido para ver opciones a finales de Agosto, hasta la firma de escrituras el 25 de Septiembre siempre hemos visto en tí un asesor formal y bien preparado. Para todos los pasos del proceso estuviste siempre aconsejando dando tanto los aspectos positivos como las consecuencias negativas. Algo que realmente puedo resaltar que no muchos vendedores hacen, ya que quieren realizar la transacción en forma rápida y no prestan atención en entender las necesidades y situación. Muchas gracias por mantenernos siempre con la visión completa de cada paso a lo largo del proceso de la compra/ venta. firstly many many thanks for your incredible performance in selling our marina condo, as you know time was the essence for this transaction and you did what no other real estate agents in Vallarta would have done! you went the extra mile and never gave up on us , I bought and sold few properties in PV and dealt with PV realty and Tropicasa and Prudentials realties and believe they do not even come close to your professionalism! they would have all gave up and the transaction would have never close at the notary! my hat to you and Coldwell banker for having you, in my book you are by far the best real estate in Puerto Vallarta and whoever has the pleasure of having you as their agent will be more then satisfied with the results , it is all about future referrals, all the best to you Robert"
"I am writing to tell you about the exceptional experience we had with Robert Bertrand, one of Coldwell Banker's agents. My husband and I were on a cruise stopping in Puerto Vallarta earlier this year. Since we had been to Puerto Vallarta on a number of occasions over the years we decided to look at condos during this visit. I got Robert’s name off the internet, contacted him and gave him the rough criteria that we were looking for in a condo. After picking us at the cruise terminal, he took us to four or five excellent properties one of which we fell in love with; made an offer and purchased. Of course, we were back on a cruise ship a few hours after our whirlwind tour, so a lot of things were handled via emails, faxes and telephone when we returned to Seattle. We are both familiar with buying condos but this was a totally different experience. Robert led us through every step of the way explaining the process required to buy in Mexico and answering our many questions. He made the transaction very easy and told us to let him know when we would be back in Puerto Vallarta. He kept us informed every step of the way which is in direct contrast to our experience here in the States when we were selling one of our condos. We returned to Puerto Vallarta on April 26th and the next day Robert took us to have our telephone changed into our names and to deposit some money on the account. This would have been extremely difficult to do on our own. He then returned a few days later repeating the process with the electricity. He had told us when we left on the ship that the transaction did not end when he had sold the property and he followed through. I can't say enough about Robert’s professionalism, knowledge and customer focus. I would not hesitate to recommend him to anyone buying property in Puerto Vallarta. I notice that Coldwell Banker has a great new website. Please feel free to display our comments about Robert on the website." I will be glad to talk to anyone regarding my business dealings with you. I encourage you to have anyone contact me. As you know, I purchased a unit at LaCima One last December. Believe me, not all realtors are the same in Puerto Vallarta. You are among the best! I can tell you Robert is “exceptional”. He looked after EVERY detail (big or small) and did a super job negotiating a great deal for us. All we have to do is enjoy our new home (the view is spectacular) in what I call paradise!! If you need any further info, please don’t hesitate to call us.